Griswold Inn Cordial and Flip Glasses from the collections of the Worthington Historical Society (WHS) may be used for educational purposes as long as it is not altered in any way and proper credit is given: "Courtesy of the Worthington Historical Society, Worthington, OH." Prior written permission of the WHS is required for any other use of Griswold Inn Cordial and Flip Glasses. Contact WHS at info@worthingtonhistory.org to request permission. Griswold Inn Cordial and Flip Glasses is realia, with genre glassware. Its dimensions are 1.75 in x 3.5 in. 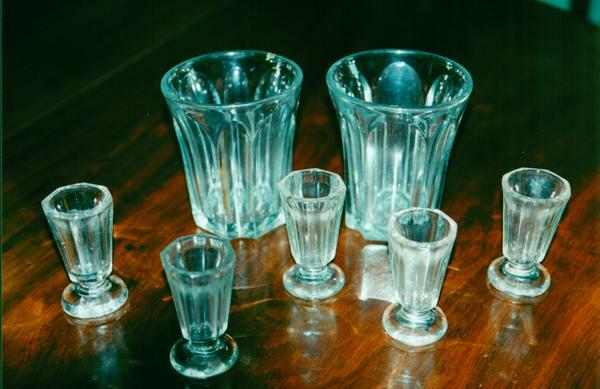 Five cordial glasses and two flip glasses in paneled style are pictured here. These items were manufactured in Pittsburgh, PA and used at the Griswold Inn. The social and business role of the Griswold Inn in pioneer Worthington represents a time when buildings served multiple uses and alcohol was the safest, healthiest beverage. Cordial and large flip glasses identify popular drinks. The ingredients of flip vary, but it connotes the process of mixing honey, egg, and whisky from one glass to another. During the nineteenth century western Pennsylvania became the center of the American glass industry, producing much of the glassware for expansion west of the Allegheny Mountains. The glassware is on display in the dining room of the Orange Johnson House Museum. The Worthington Memory identification code is whs0031.